The larval and pupal stages of an insect's development are consecutive but very different. The larva is generally a worm-like creature that emerges from the egg, the first life stage. The pupa is the seemingly sedentary, transformative form following the larval stage. Going through both stages to reach adulthood is defined as complete metamorphosis in insects. The larval stage begins as soon as the young hatches from the egg. Often the primary function of the larva is to feed, gathering energy that will be used in the subsequent life stages. In some species, such as the rosy maple moth (Dryocampa rubicunda), the adult insect never eats, relying only on energy stores consumed in the larval stage. Although larvae are generally considered "baby" insects, often it is the adult stage that's the shortest and least influential in the species' life cycle. The adult's only purpose may be to mate and produce more eggs, while the majority of the insect's life is spent in the larval stage, performing the most productive or destructive tasks, such as defoliating precious crops or converting rotting matter into fertile compost. The pupal stage is passive on the outside but transformative on the inside. 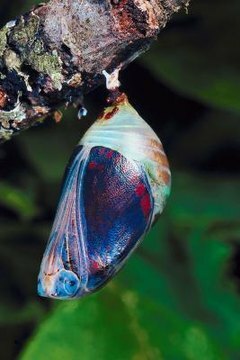 While appearing as a still, dark, hardened mass, the pupa is actually a truly fascinating part of the insect's life cycle. Inside the protective outer shell, the insect's body transmutes from a chubby, squishy mass into some of the most graceful forms seen in the animal kingdom -- for instance, the luna moth (Actias luna). Within the pupa the larva essentially digests itself from the inside out. The body is broken down into undifferentiated cells, which can then differentiate into the cells needed for the insect's new physical form. Complete metamorphosis is when insects go through the egg, larval, pupal and adult stages. Examples of insects that undergo complete metamorphosis include butterflies, moths, flies, wasps, bees, ladybugs and other beetles. In complete metamorphosis the larval and adult stages look completely different from one another. For instance, a ladybug larva resembles a prehistoric trilobite, with its pointed abdomen, black, jagged carapace and orange markings. The wriggling, white-bodied, red-headed scarab larva looks nothing like the hard-shelled, sleek-winged iridescent flying machine that emerges from its pupa. Not all insects go through so many developmental stages. Incomplete metamorphosis describes insects whose body forms are relatively similar between hatching and adulthood. They emerge from their eggs as miniature, undeveloped versions of their adult selves. These juveniles are called nymphs. Nymphs go through molts, shedding their exoskeletons, allowing them to grow until they reach their adult size. Grasshoppers, dragonflies and praying mantises are examples of insects that undergo incomplete metamorphosis. Within the parameters of the basic life cycle, insect species have adapted myriad ways to carry out their reproduction in a broad spectrum of environments. Mosquitoes undergo their larval and pupal stages in water, while other bugs, like the cricket, carry out their transformation underground. Some larvae are herbivorous while others are carnivorous, or even parasitic. A particular kind of parastic wasp (Aphidius ervi) lays its eggs inside aphids. When the eggs hatch the larvae eat the aphid as their first meal. The larva of the common housefly (Musca domestica) is commonly called a maggot and feeds on any decaying matter, especially dead flesh. Bee larvae eat only what is called bee milk and bee bread, which is supplied to them by worker bees. What Type of Bugs Come Out of a Cocoon?